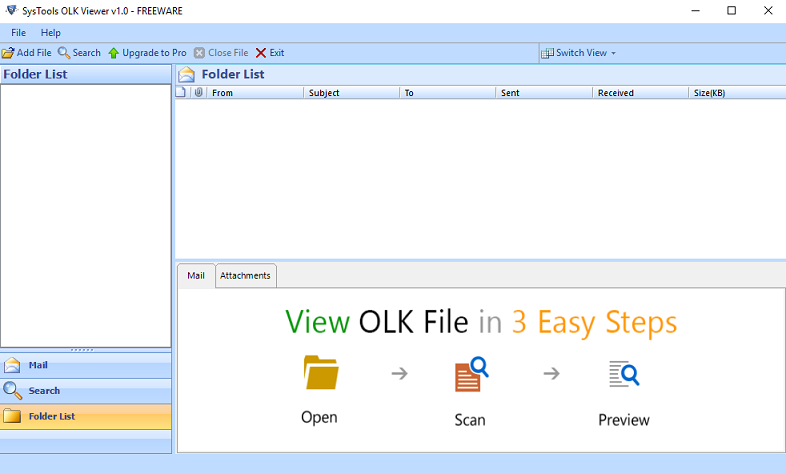 OLK file viewer is a free-ware solution that help users to open OLK14message data on Windows operating system. This is an independent application which can also read all backend files of Mac Outlook such as olk14MsgSource, olk14event, olk14contact, olk14MsgAttach, olk14note etc. 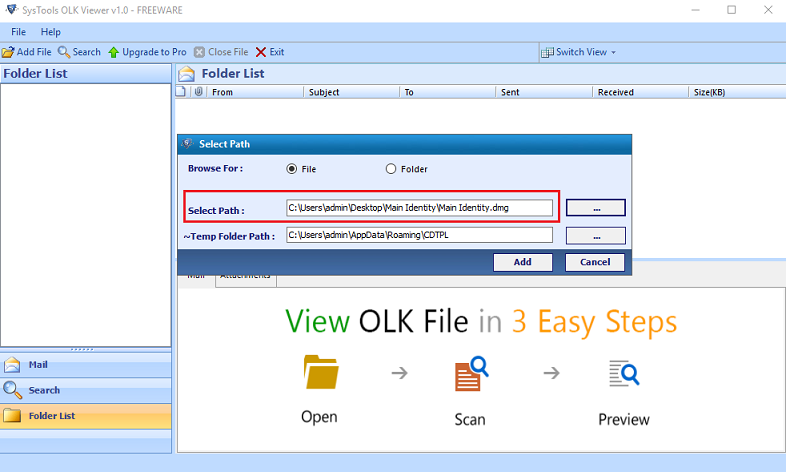 OLK14Message viewer is capable enough to scan and open olk14message file without any issue. Olk14message is a file of Mac Outlook 2011 which contains the header portion of particular email such as To, From, Date, Subject etc. Olk14MsgSource is a backend file of Outlook for Mac which stores the actual body of an email message. This OLK14MsgSource reader also provide users to extract and view all the data of this file without any extra effort. Free OLK file viewer professionally deal with all attributes file of Outlook 2011 database. OLK14Event is also an attribute file which stores the information about an event of Outlook calendar which include date, time and invitees. Users can quickly open olk14event file with the help of this tool. This OLK file viewer is a standalone application which designed with some advanced features. It can also provide preview of other backend attributes file of Mac Outlook database such as olk14MsgAttach, olk14contact, olk14note etc. Individual email item data is stores in different OLK files. So its very difficult to add each OLK file in the software and view its data. This OLK viewer freeware utility supports preview of multiple file at the same time. Users can add multiple files or folder in the software with one click. Whenever user open OLK file with this software, it will keep the data as it was before in Mac system. That means it maintains the integrity of all the data items of OLK files. This feature make this OLK viewer software reliable and easy to understand application. The files discussed above are the main files for which user generally search. There are more OLK files i.e. olk14MsgAttach, olk14contact, olk14note, olk14category, olk14signature etc. Why to Open OLK file with OLK14Message Viewer? We can view OLK file with manual technique but this method will not suitable to read OLK message as it was before. When we use manual trick it does not maintain the integrity of that file and structure of file changed. To avoid this type of issue we use OLK viewer freeware tool. This software scans and preview every type of OLK file without any change in actual data. Users can easily open OLK14Message file of an email item. Step 1: Install the software after downloading. Start the tool from Start >> All program >> OLK Viewer. Click on Add file. Step 2: Browse for the file or folder you want to add. 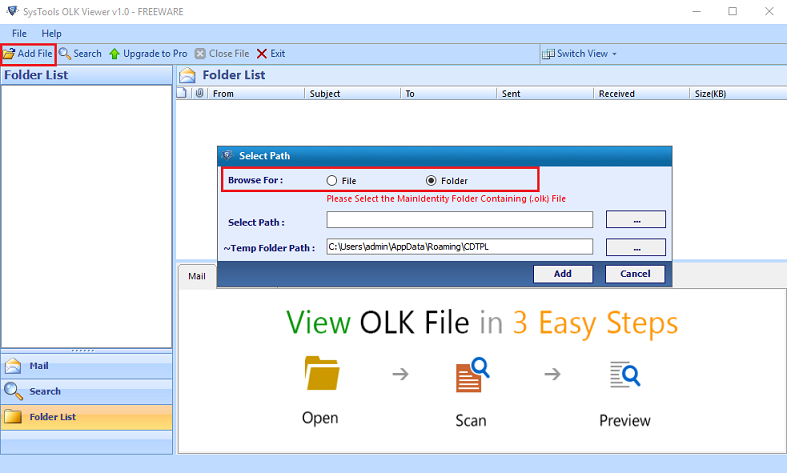 Step 3: Select the path of OLK file and Click Add. Step 3: Whole scanning process will be visible on the screen. Deleted Outlook Identity Emails but found OLK14Message file. How read this file with OLK File Viewer? OLK14Message Viewer is designed under expertise team, It can easily fetch data from all type of OLK file. 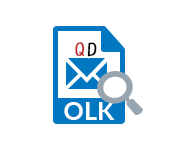 Users can easily view and read OLK file with this solution without any alteration. Is this possible to view more than one OLK file with OLK14 message reader? Yes, This OLK14MsgSource reader provides an advanced feature through which users can easily add folder of multiple OLK file at once and open them with one click. 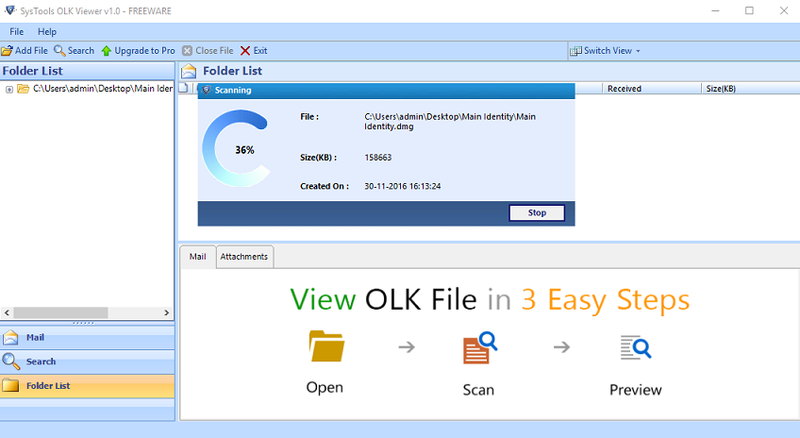 We easily open OLK file manually they why we should opt this OLK viewer tool? Manual method to view OLK file does not maintain the data integrity. In result it will change the format of OLK file data. Hence if we use OLK14Message viewer it will give exact message to read OLK file and this is a freeware utility. Users do not have to invest on this application. Accidentally deleted the identity from Mac Outlook 2011. After various failed attempts to access data from temporary file I found OLK file viewer. With the help of this solution I can view OLK14Message file with all other corresponding files. Thanks to QuickData team for putting such an excellent OLK14MsgSource reader. I had lost my profile and was left only with olk14message files, which were not in a readable format. I looked for ways to read the file, but they were too complicated and risky to implement. Thankfully, somebody suggested olk14message viewer which offered a much easier way to read OLK file messages.